U.S. farm debt has been increasing while farm profitability continues to fall. This week we examine how these two trends have impacted various measures of repayment capacity and liquidity. As we discussed last week, U.S. farm debt has been increasing. These increases have occurred while farm profitability continues to fall. This week we examine how these two trends have impacted various measures of repayment capacity and liquidity. U.S. farmers have now experienced 4 years of declining returns. Figure 1 shows the real ($2009 USD) return to farm operators from 1970-2017f. The average return to farm operators over this time was $60.8 billion. The green and red lines indicate the level associated with 1 standard deviation above and below this line. The sector has experienced a sharp decline, from well over 1 standard deviation above average, to today’s value which is roughly equal to one standard deviation below average. The returns to operator have not been this low since 2002. Before that, one must go back to 1983 to find a lower value. Figure 1. Real Returns to Farm Operators, 1970-2017F. The reduced returns in agriculture have impacted farmers ability to service debt. The times interest earned ratio is calculated by adding interest expense to net farm income and then dividing by interest expense. This ratio basically provides a quick estimate of how many times interest payments are covered with income. It is shown in Figure 2. The higher the times interest earned ratio, the easier it is for farmers to meet their interest obligations. The times interest earned ratio has fallen quite dramatically with the decline in net farm income. Today, it stands at 4.4. At its peak in 2013 it reached 9.82. In other words, it is about half of its value at the start of the decline. The declines in the times interest earned ratio have clearly been softened by the generally low interest rates of recent years. Figure 2. 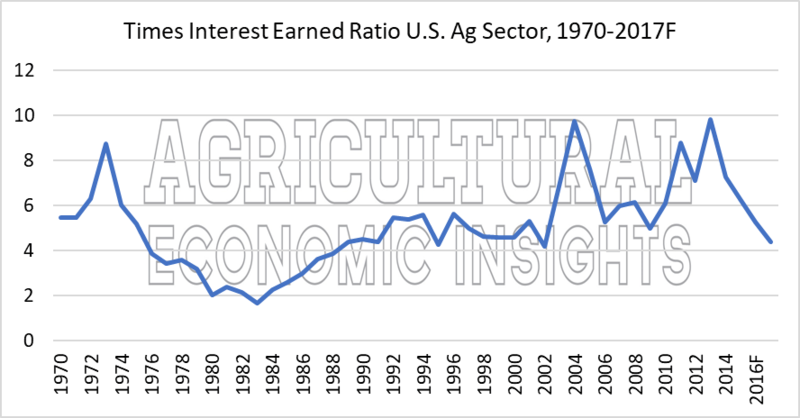 Times Interest Earned Ratio, U.S. Ag Sector, 1970-2017F. The times interest earned ratio considers only on interest expenses and net farm income. Another measure of repayment capacity is the debt service ratio. This is calculated by dividing interest and principal payments by the value of farm production. This provides an estimate of percent of farm production consumed by interest and principal payments. It is shown in Figure 3. Today, principal and interest payments consume 28% of the value of farm production. This level was again last seen in 2002 and to find another value this high one must again go back to the 1980’s. At the sector level, both the times interest earned and repayment capacity ratios indicate that the ability to service debt is declining. Figure 3. 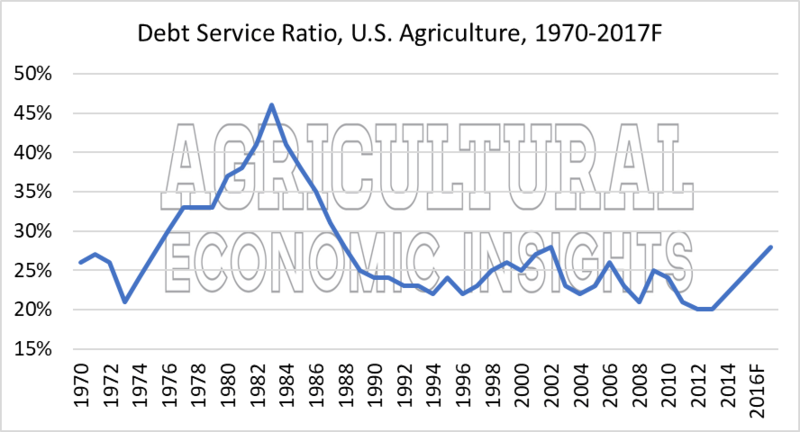 Debt Service Ratio, U.S. Ag Sector, 1970-2017F. One likely reason that real estate debt has risen so quickly is that farmers and lenders have tried to restructure debt so as to reduce the short-term burden on repayment capacity and improve liquidity. One measure of liquidity is working capital or current assets minus current debt. 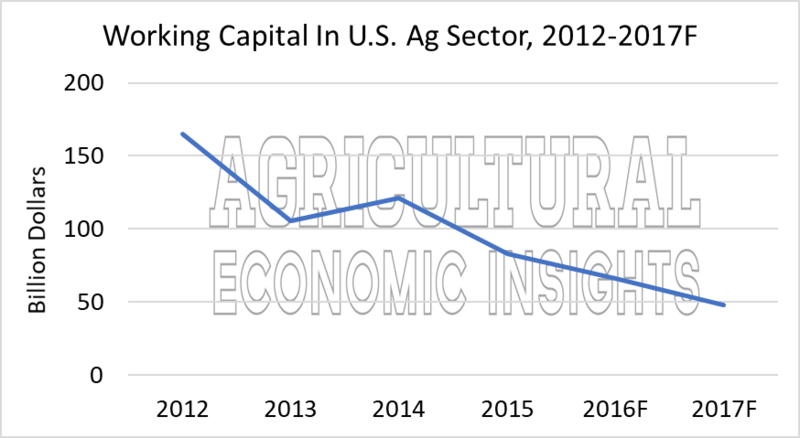 At the sector level, the USDA started reporting the working capital in 2012. This is shown in Figure 4. As one can see, the decline in working capital at the sector level has been significant. Today, the value stands at $47 billion. Just 5 years ago in 2012 it stood at $165 billion, roughly 3.5 times today’s level. The decline has been swift and significant. The last measure of repayment capacity we will consider is the debt repayment capacity utilization, or DRCU. We provided a description of the construction of this measure in this post. DRCU is a farm level measurement calculated by the Economic Research Service (ERS). It considers both interest and principal payments in relation to cash flow. This measure is provides an estimate of how much of a farm’s theoretical repayment capacity it has used. For instance, a DRCU value of 100% means that the farm has used all of its theoretical repayment capacity. The DRCU for three different size classes of farms is shown in Figure 4. Because this data is based on the ARMS survey the most recent data available is 2015. This was two years into the four-year (so far) downturn. A couple of things are worth noting. First, it appears that repayment conditions have deteriorated most for farms in the two smaller sales categories. Both farms in the $250 to $500 thousand and $500 thousand to $1 million sales categories have seen rapid increases in the amount of their repayment capacity that they are utilizing. In other words, their financial situation has rapidly deteriorated with the decline. One should also keep in mind that conditions at the sector level have deteriorated since 2015. This is somewhat troubling and one must wonder whether financial conditions on these farms have continued to deteriorate at the rate they did in 2014 and 2015. Figure 5. 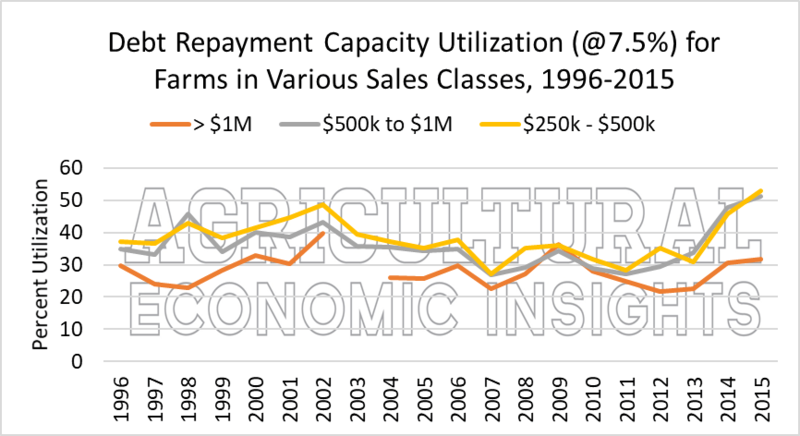 Debt Repayment Capacity Utilization for Farms in Various Sales Classes, 1996-2015. It’s really hard to argue that financial conditions in the farm sector have not declined in the last four years. Some of the declines are notable. For instance, the sector has seen a dramatic reduction in working capital. Further, farm debt has increased while farm incomes and repayment capacity have fallen. To this point, the farm sector has not experienced significant challenges with credit repayment. This is likely in part due to the very favorable situation that the sector was in at the beginning of the downturn. One must wonder how many more years this cushion will last if incomes don’t improve.